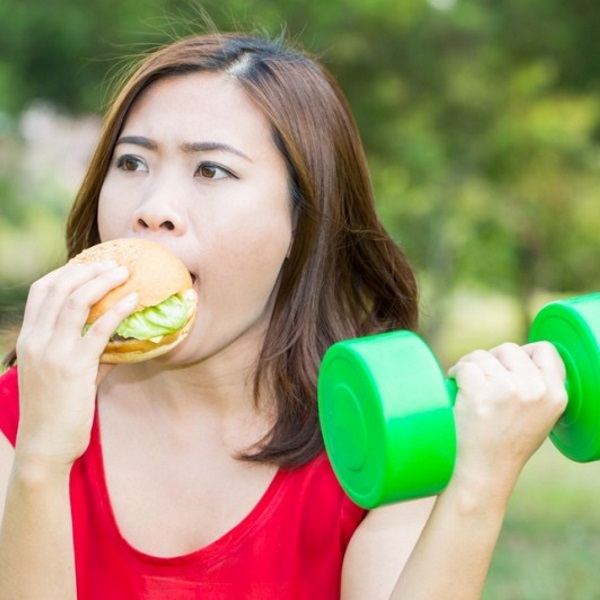 You may think you’re burning off your bad eating habits, but chances are you’re just making weight loss harder. Maybe, just maybe, if you squat till you drop and burpee into oblivion you can burn off those fried fish tacos, chocolate frosted donuts, and bags upon bags of Funyuns. The burn-and-refuel mentality is dangerous. If you burn 600-800 calories boxing, in a HIIT session, or running then treat yourself to a double cheeseburger, then yeah, your fat loss has just become a herculean struggle. Calories are not created equally. You’d never say the calories in spinach are the same as the ones in a pint of ice cream, right? The calories in spinach trigger different reactions in your body than whatever Rocky Road concotion you’re shoveling in by the spoonful. Start to think of food as information; different nutrients have different physiological effects and distinct roles within the body. So, if your diet consists of lots of sugary crap, the thinking goes, you can exercise all you want and still struggle to stay trim. But, eating a little extra on workout days in the form of good calories (like that spinach, protein-packed grilled chicken, a protein shake, etc) could actually help you reach your fitness goals. Figure out how many calories your body needs depending on your fitness level here. Then, make sure you’re getting them from good sources. Check out the Get Ripped Grocery List for some ideas. Aside from bulletproofing your body against injury, crafting a killer physique, and helping your overall quality of life, research proves exercise can make marked improvements in preventing, managing, and reducing the symptoms of cardiovascular disease, Type 2 diabetes, dementia, and some cancers.